The safety of our McCabe students is always at the TOP of our priority list. We realize mornings can be very hurried and hectic as can the afternoon pick-up in the car lines. Let’s work together to be sure each and every student gets to their destination whether it be school or home each day. 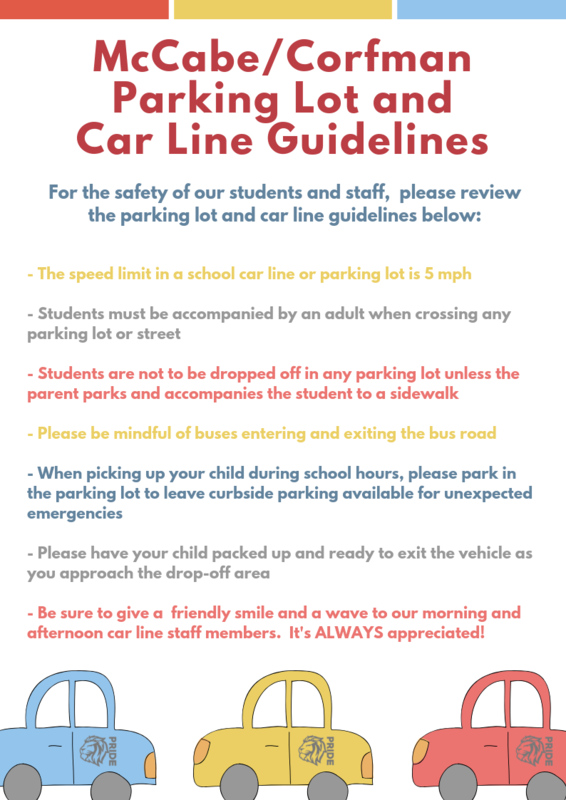 Please look over the attached flyer with your child to be sure he/she is also aware of the parking lot safety guidelines. Remind your child that NO CHILD is permitted to walk across any parking lot without an adult with them. Please do not park in the lot and have your child walk to you. You’re welcome to park and walk up to the front of the school and walk back to the car with your child by your side. This also applies to dropping children off in the mornings. McCabe continues to do its best to protect all of its students! PTO’s Mother/Son “You’re My Superhero” Dance (TK-6th grade students) will be held on Friday, April 5th from 6:30pm-8:30pm in the Corfman MPR. Tickets are available for purchase through both school offices. Doors will open promptly at 6:30pm. They’ll have a DJ, face painting, nachos, and popcorn! $10/couple - $5 for each additional child. 8th GRADE: Catalina payments are now due in full. Bills have been sent home with your child on bright yellow paper. If you’re unsure of your balance, feel free to give Jennifer Castillo a call at (760) 335-5205. CAFETERIA BILLS: Cafeteria bills have been sent home with your child. Please check backpacks for balances due.